Please consider this a personal invitation to you. So you own a gun, maybe you have license to carry a concealed firearm, but does your responsibility end there? Now, more that ever is the best time to learn more about your rights as a Law Abiding Gun Owning Citizen (LAGOC). I am very happy to team up with US Law Shield to hold this seminar that is open to the public. Just as you arm yourself for home and self-defense with the best ammunition, you need to also arm yourself with best legal knowledge that all LAGOCs need to know. I teach the seminar along with 20 year member of PSP, Corporal Todd Hoover, who just recently retired. He now teaches tactics, self-defense, and NRA marksmanship. 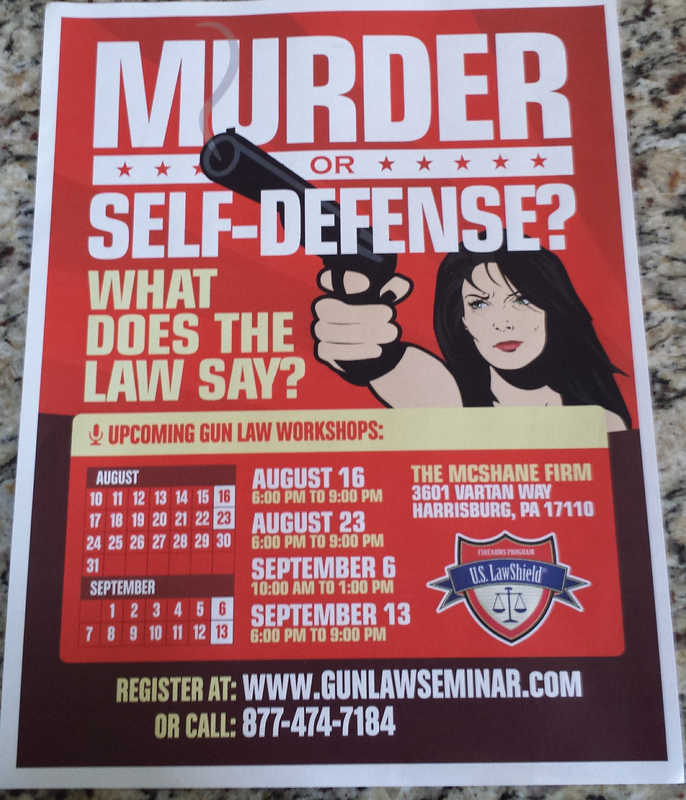 This seminar is geared towards people who want the straight truth on lawful possession and use of a firearm. It is great for those who are considering owning a gun and for those who regularly and routinely practice their Article 1 Section 21 and 2nd Amendment rights and conceal carry their firearms. All are welcome. We go over Pennsylvania laws that govern firearms in PA, the law of self-defense (stand your ground, and the castle doctrine), defense of others, defense of property, where and when you can carry or possess a firearm, how to get a conceal carry permit, revocation of a concealed carry permit, reciprocity with other states, interstate travel, the top 10 mistakes that concealed carry holders make, civil lawsuits that law abiding citizens who own weapons need to learn about, and how to interact with the police after a critical incident (display, use or discharge of a firearm). We did the first one last night with rave reviews. It’s at my office, The McShane Firm, LLC, 3601 Vartan Road, Harrisburg, PA. The upcoming seminars are small group (no more than 50). Questions and answers are encouraged. No firearms-related topics or questions are off limits. The upcoming dates are August 23 (6pm to 9pm) September 6 (10am to 1pm), and September 13 (6pm-9pm).